On the well-established provider of stylish serviced apartments worldwide- introduces new business segment: Shared Offices. The temporary and flexible office solutions are available in different styles and sizes, tailored to the individual needs of business clients. 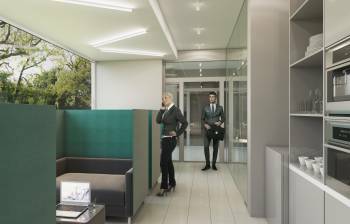 Further offices with service and style are to be created in other buildings soon, in Switzerland and abroad.The new location offers 5 private offices, closable with secure key code system. Each office includes 2 working stations. Spacious interiors are designed in the uncluttered modern style, fully equipped with streamlined furniture and bright color palette. The rentable interiors include co-working spaces and small meeting facilities as well as a kitchen. Clients / Guests can choose between daily, weekly or monthly rates, starting from CHF 80/day. Access hours vary depending on the length of the booking period. For bookings longer than 1 month, offices are accessible 24/7, including the weekends.A private office includes 2 desks, 2 chairs and 2 roller away cupboards. Apart from WiFi, LAN, HDMI adapter and phone land line can be arranged at an additional charge. The price includes basic office equipment and a multi-function printer. Lounge areas are fitted with comfortable sofas and desks providing a perfect environment for private business meetings. The location offers a kitchen equipped with a coffee machine, kettle and microwave & table top. For greater comfort of our guests, a private bathroom is at their disposal.A Wi-Fi Internet connection is available in every office. Upon request tenants can upgrade their Internet solution, order LAN, HDMI adapter or a phone land line. The price includes cleaning service with garbage disposal twice a week. A personal letter box is also included in the price.